Mérida, Venezuela (22/09/2018). 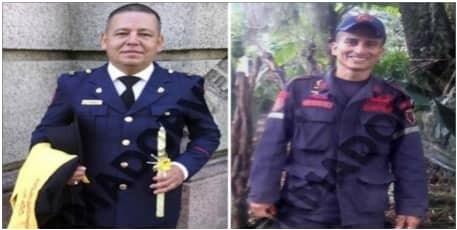 — Carlos Varón and Ricardo Prieto, firemen from the State of Mérida Fire Department, who were imprisoned for recording a satirical video of Nicolás Maduro, were transferred to a police prison located in the town of Bailadores, municipality of Rivas Dávila, state of Mérida. The transfer was carried out on September 21, 2018, from the Directorate General for Military Counterintelligence (DGCIM) headquarter in the city of Ejido, municipality of Campo Elías, state of Mérida, without notifying their relatives of the decision. The firemen, who are being prosecuted by aggravated charges of hate, were taken to a police prison located in the town of Bailadores, which is at least two hours away from the capital city of the Andean state. The Observatory of Human Rights of the University of Los Andes (ODH–ULA) was informed of the decision when one of the detainees’ relatives visited the DGCIM headquarters and found out that they had been taken to a new location. The firemen are now held in custody in a station of Polimérida, the regional police of the state of Mérida, but their families were not informed of the proceeding. The ODH–ULA expressed concern over this action, since the firemen were taken to a place far away from their families, which implies more expenses on non-perishable food and transportation for them, in the midst of the economic crisis the country is facing.